Mike & Gabby: Welcome to the family! My sister adopted a new puppy about a week ago. His name is Chance and he's about 5 months old. 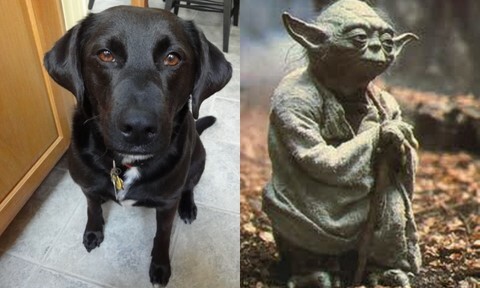 He's a cross between Gabriel and Yoda. He's an adorable bundle of energy. Lots and lots of energy. Welcome to the family Chance! He came up for a visit yesterday. And before he even made it into the house, Gabriel was all over him. They played and played and played and then played some more. It got to the point where they were both completely exhausted, but if one of them twitched, they were right back at it. Once he left yesterday, Gabriel passed out and she's slept all day today as well. Get a load of those ears! Aren't they just the cutest things ever? But it would be difficult to stay mad at that face - and those ears! Gabriel is looking forward to another longer visit - hopefully in the next couple of weeks. I understand that Chance was exhausted yesterday as well but full of energy again this morning. He's constantly on the go but if you start to rub his belly, he just stops whatever he's doing. It was a real pleasure to meet you Chance and Gabriel's looking forward to many more playdates! "There is nothing I cannot master with the help of Christ who gives me strength."